This is Susan from A Little Bit of Heaven on a Plate idea. "Something a bit different, not a recipe, a review, a cake, or a book...but instead more about other food bloggers and a game of tag. I know its Christmas pre-baking prepping season and we've not time to dust a rolling pin, but what the heck, lets have a bit of fun!" This is a "tag" where I am supposed to answer 10 questions that tell you a little bit more about myself. So here goes! 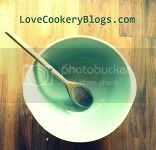 I had been reading blogs for quite a while and often used them for inspiration for recipes or crafts. I got addicted to pinterest and thought about how I could take this further. A blog seemed like the way forward. My foodie inspiration is definitely my mum. She taught and encouraged me to cook. One of Jamie's books and the recipe binder I stick all my favourite recipes in, and now my laptop as I am often referring to a recipe on my or someone else's blog! An absolutely stunning six course menu at a French Chateau in Beaune. I was only 15 and it was the first time I had duck. The whole meal was amazing. I would love to eat at Karen from Lavender and Lovage's table. All her recipes look delicious. I would love a Kitchen Aid but if not I will make do with a set of two matching round cake tins. Currently working with different sizes! My mum and all the bloggers out there. I have an archaeology degree and love F1. well done for being so quick on the uptake! I have been tagged by Choclette & Karen so need to get my act together sharpish. Really great to know a little bit more about you and the "about me" pages on blogs always draw me in too. Thanks for taking up the rolling pin Kate and playing along with unplugged! I am VERY impressed with your academic qualifications and the fact you like BIG FAST cars! THANKS so much for wanting to be at my table, the offer is ALWAYS open to you and who knows, maybe you can visit me in 2012 for a French Tweet Weekend! This is fun, I'm really enjoying this game! I'm really enjoying reading everyone's answers and discovering the blogger behind the fantastic blog!